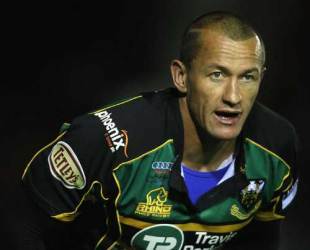 Carlos Spencer has signed for Gloucester just four days after leaving fellow Guinness Premiership side Northampton Saints. Former All Blacks fly-half Spencer, 33, has signed a 17-month deal with the West Country side after agreeing his release from the Saints, having failed to pin down a regular starting spot in the Premiership this season. "It's a great coup for us," said Gloucester boss Dean Ryan. "Understandably, given his quality, experience and availability, there were a number of clubs keen to sign him and I am delighted we have got there first. "Carlos will give us something a little bit different - a mystique and an ability to function at the highest possible level. He has huge international experience with the All Blacks, and we believe he will be a great asset should we progress into the knockout stages of competitions later in the season. I am delighted that such an outstanding professional has agreed to join us." Spencer possesses 35 caps for New Zealand and will now compete with Ryan Lamb, Olly Barkley and fellow Kiwi Willie Walker for the outside-half berth. With Gloucester's current injury woes at scrum-half it looks likely that Lamb will deputise at No.9 in the near future in place of Rory Lawson, Gareth Cooper and Dave Lewis, possibly opening the door for Spencer. "I left Northampton with a ton of great memories. The club were fantastic, and the supporters always treated me in a way I will never forget," said Spencer. "Everything has happened pretty quickly over the last few days, but the opportunity to stay in the Guinness Premiership and join a club as talented and ambitious as Gloucester is a rare one, so I am thrilled. "Gloucester have been at the forefront of the game in England for a number of years, but the excitement of the challenge is driven by trying to help them take that last extra step and become winners. That is what excites me - I am joining a club that is genuinely challenging for the top honours around, and I want to give it everything I can to help make them even more successful. "They are a great team, with strong competition for places, and I hope that I can play my way in and contribute fully to the end of the season push for honours."